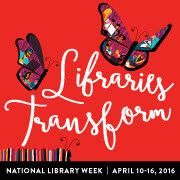 Join Roselle Public Library as we celebrate "Libraries Transform" during National Library Week 2016, April 10 - 16. Libraries transform you, as users. You transform your Library! Has your Library transformed you? We invite you to Share your story on the Library's website. Share your memories and let us know how the Library has transformed you, your family, and our community.